Many men and women are making the transition from a diet which heavily revolves around eating animal protein, to one which is more plant based. This is because a plant based diet has shown to provide us with improvements to our health in many different respects. While plant based foods are generally considered to be healthier for us than a diet revolving around meat, it does tend to lack significantly in one particular area, that being protein. There’s a perception out there that animal based proteins are just superior to plant based ones, when in fact the opposite may just be true. Including more plant base foods in your diet is definitely going to improve your health, and if you choose the right types of plant based foods, you won’t have to worry about becoming deficient in protein either. Here is a list of plant based food that are both healthy, and contain plenty of protein. 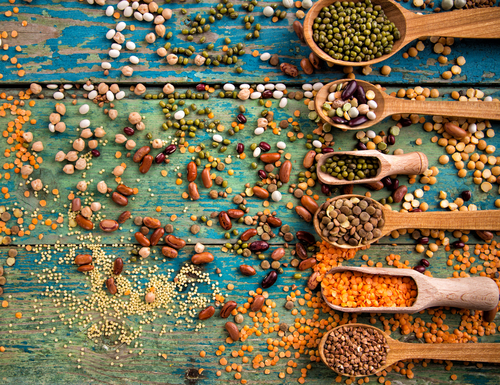 Lentils are type of food that is loaded with a variety different types of nutrients. Lentils also contain a good amount of fiber along with all the micronutrients that it provides us, which goes a long way when it comes to managing our blood sugar levels, and a healthy digestive system. Another benefit to lentils is that they can be used diversely in a number of dishes such as in pastas, salads and soups. The one drawback to lentils is that they do take some time to prepare, usually around 30-45 minutes to do so. They do keep rather well though, so you can make them in rather large batches which you can then refrigerate to last you for the remainder of the week. Beans and legumes are similar to lentils in that they contain a good assortment of nutrients essential to our health. They contain both the micronutrients the body needs to carry out various processes, and the macronutrients to provide the body with the material it needs to keep the body running optimally. Beans and legumes contain a good amount of carbohydrates, protein, and fiber which helps to fight hunger as well. The carbohydrate value here is high which keeps you energized throughout the day, and the fiber helps to slow digestion and absorption of sugar into the blood stream. The only problem with beans and legume are their tendency to cause indigestion, which can be avoided by pre-soaking them for about 24 hours prior to use. This food is created through the fermentation of soy beans, which not only makes it nutritionally rich, but also a good source of probiotics as well. 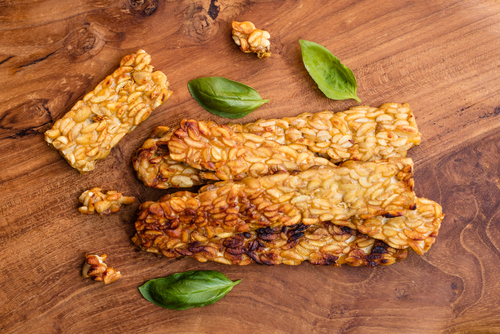 Fermented foods like tempeh provide the body with beneficial bacteria which aide in the digestive process, increasing nutrient availability to the body. This is another substitute that can be used in a variety of ways, making it an extremely popular choice to use in a pinch. Also something else to consider here is that despite the perception that soy foods may lead men to be effeminate due to their high concentration of phytoestrogens. This has proven to be false, and studies have shown no negative causation between eating soy based foods and increased levels of estrogen in men. Mushrooms are a food you should be eating more of for a variety of reasons. As far as nutrition is concerned, these foods contain a good amount of trace minerals such as selenium, copper, phosphorus, and potassium. They also are a great source of B vitamins, while also being extremely low in calories. Due to their spongy nature they are also great foods to use in marinades or in other types of dressings as they easily absorb all of that flavor. This attribute also means that they can be used it pretty much any dish to help enhance its flavor. Finding mushrooms, lentils, beans and legumes should be that difficult at all. Every grocery store large or small will carry these items, and you should be able to find them anywhere. Fermented soy products like tempeh may be more difficult to come by, which can be purchased at your local health food store if your grocery store doesn’t carry them. It is important to keep in mind that when you are shopping for soy product specifically, that you choose ones which have gone through the fermentation process. Similar to how beans which aren’t soaked can upset our digestion, soy products which do not go through the fermentation process can cause the same issues. Next ArticleWhat Effects Does Sodium Have on the Body? How Does Sodium Affect Weight Gain?